Peter LaFleur is a charismatic underachiever and proprietor of a rundown gym called Average Joe's. The facility's ecclectic clientele of decidedly less-than-"average Joes" is comprised of: a self-styled pirate; a scrawny nerd who dreams of impressing an unattainable cheerleader; an obsessive aficionado of obscure sports; a dim-witted young man; and a cocky know-it-all who, of course, really knows nothing. Peter's humble gym catches the eye of White Goodman, the power-mullet-sporting, Fu-Manchu-d, egomaniacal owner of Globo Gym, a gleaming monolith of fitness. White intends to take over Average Joe's, and Peter's non-existent bookkeeping is making it all too easy for him. A foreclosing bank has stationed attorney Kate Veatch inside Average Joe's to finalize Globo's takeover of the gym. But Peter's boyish charms win her over and Kate joins his team of social rejects to beat the odds--and their own ineptitude--to try to save Average Joe's. How? 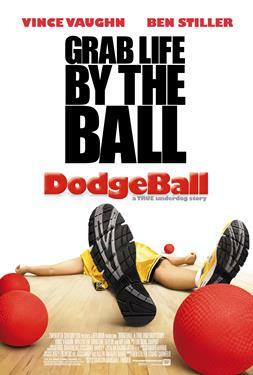 A showdown dodgeball competition against Globo Gym.